Some new faces have been showing up around here. Give me a few moments to share some of these with you. The Chocolate Cartel. You honestly cannot think of local chocolates without thinking of the Cartel. 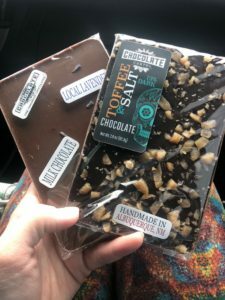 Tim and Scott Van Rixel have set the bar for just how good a New Mexico chocolate company can be. They blend the wonderful chocolate flavors with some spices from New Mexico to make some truly unique treats. Each bite has layer upon layer that will keep your taste buds guessing and coming back for more. Look for a great selection of their favorites on our website now and they will definitely be a staple for our gift boxes this upcoming holiday season. Speaking of the holidays, Gift Boxes. We will have some incredible local gift boxes available for you to win over anyone on your shopping list. Our Product Pioneers, Victoria and Sarah, have been searching the Land of Entrapment for the best flavors our state has to offer. These producers will be highlighted in our gift boxes, but also filling up our website with the best of New Mexico. If you have a business or lots of gift boxes you are looking for this season, please contact us soon so we can help build out a memorable holiday gift. As the late/great Bob Marley reminded us, “We Jammin’” And so when local food celebrity, Heidi, heard Bob’s song, she was driven to make tons of Raspberry Jam. 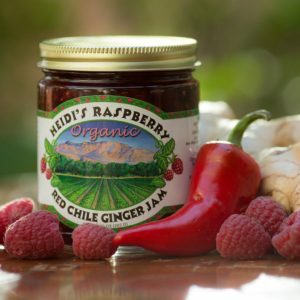 Since 2001, Heidi has brought some of the highest qualities jams that you will find anywhere to the Farmers’ Markets and stores here in NM. Her jams are on the web site now as well. Organic Valley (OV)has been leading the way for Organic dairies to come together and sell under one label for many years. OV has made it possible for many dairies to grow Organically. They are a cooperative owned by the producers and have succeeded in bringing producers together when many other groups efforts have failed. I don’t know if you know this, but farmers, ranchers, and dairy folks are some of the most stubborn sons of guns that you will ever meet. So to get all of them to play nicely in the same sandbox is no easy feat. Our nation’s agricultural producers are deeply rooted in traditions and routines, in order to get that train moving in a different direction takes patience and commitment. Organic Valley has offered that commitment to producers and consumers over the years. We are happy to be adding some of their high quality certified Organic dairy products. They also have seen the swell of support for more Grab n Go items in the marketplace, too. We will be offering more Lunch and Snack items for you and your familia to enjoy moving forward here. From my own personal experience and I am willing to bet that I am not alone, but I make the worst food decisions when I am pressed for time. So I not only want these Organic farmers to sell more fruits of their labor, but I also want all of us to have the choice to eat healthy even when our lives get hectic. So take some time to look at all of their offerings as well. I think you will find some amazing flavors, quality, and value that the OV cooperative brings to the table…or website as it may be. Lastly, my little pet project, indoor growing. If you have been around with us for longer than a week, you probably know that I am really bad at sitting still. I love trying new things. 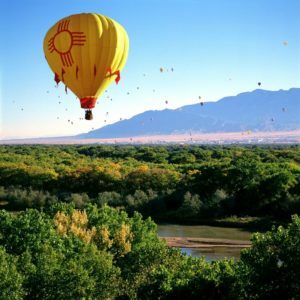 So I have been thinking a lot about what I love and hate about growing outside here in NM. This beautiful state has so many things in the Plus column, but consistency of weather is not one of them. With that, this fall I have brought a slice of the farm indoors. We are trying out a completely indoor growing environment that will (possibly) allow for year-round lettuce, herbs and greens production. I have also added fresh Living Sprouts to the mix. 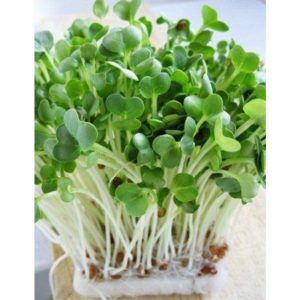 Our first harvest came this week in the face of Radish Sprouts. Great addition to a salad or sandwich. All of the sprouts will still be alive when they hit your kitchen. Then you simply snip off the sprouts and add them to your meal. Great splash of flavors.